The Lowchen has a naturally energetic and loving character. This breed tends to be a quiet and peaceful companion, while also enjoying playful sessions and games. The Lowchen is a devoted breed and committed to its owner or its family. This breed is an ideal choice for a family that is not overly active and looking for a calm and relaxed pet. It has a natural need to please and can easily learn and follow commands making it a great choice for a house pet. On occasion, the Lowchen may have a tendency to bark or dig. The Lowchen can have its physical activity needs sufficiently met with a walk or an energetic play session on a daily basis. It also takes pleasure in being challenged mentally with a game indoors or outdoors. The Lowchen should live in an indoor environment; however it enjoys the opportunity to be outside in a yard during the daytime. The coat maintenance is moderate with brushing or combing being necessary a few times per week. In order to keep up the lion coat of this breed, clipping is required every other month as well. Many owners of the Lowchen favor keeping the coat in a puppy clip. There are no significant health concerns for the Lowchen. 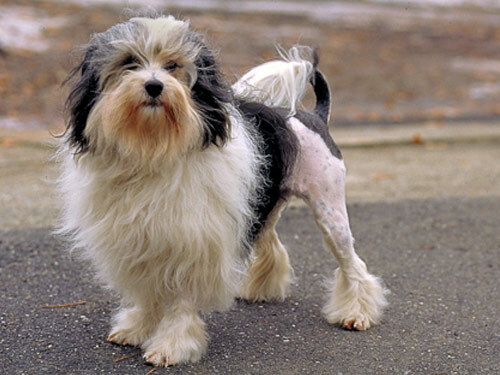 A minor health concern for this breed is patellar luxation, which involves the displacement of the knee from its natural groove pattern. On occasion, the Lowchen may experience problems with its heart and the mitral valve. To keep this breed healthy, it is suggested that testing of the knees and cardiac tests of the heart be performed on a regular basis. The average life span of a healthy Lowchen is 13 to 15 years. The name Lowchen means Little Lion Dog or Le Petit Chien Lion in French. It has origins connected to the Bichon family, including the Bichon Frise and Havenese and several others. Many countries have claimed to be the native land of the breed, including France, Germany, and Russia. However, the specific origin of this breed is unclear. A dog with similar characteristics to the Lowchen is seen in pieces of German art from the sixteenth century. The unique coat of this breed is customarily clipped short from the last rib the hock joint. The front legs are clipped from the elbow with the feet being clipped as well. The tail is clipped approximately halfway and any long hairs are to remain shapeless. By the 1960s, the Lowchen had almost vanished with very small numbers of the breed in existence. Two breeders helped to save the breed by bringing a few varieties of dogs over to Britain from Germany. Due to the limited number of each breed that was available during this time, the dogs that were brought over were crossbred quite a bit and formed the foundation for the Lowchen in Britain and also in America. In 1996, the breed was accepted into the AKC Miscellaneous class and eventually became entered into the Non-Sporting Group in 1999.